In this guide, we will introduce four types of air conditioners that are available in the United States. The goal of this guide is to present options for home owners so that you can make a more informed purchasing decision. The types of air conditioners that exist on the market are: (1) central air split systems, (2) wall or window AC units, (3) portable air conditioners, and (4) ductless mini splits. Central air split systems are oldest and most common system in use in the United States. Typically you would have a condenser outside that is connected to a coil inside the home and an air handler. The coil and air handler are located in either the basement, attic, or in a small enclosed room. Some central air split systems a heat pump inside the condenser to run both heating and cooling capabilities. The central air split system is controlled by a thermostat. When it is turned on, the air handler, coil, and condenser work together to deliver cold air through the duct system to the entire house. Central systems are the staple of heating and cooling in the United States. As a result, many homes are constructed to accommodate these systems. This includes: (1) a dedicated location for the condenser, (2) ceiling and attic space for ducts, (3) dedicated openings in the house for the air handler and coil. Installing these units are relatively straightforward and there are many local HVAC companies and suppliers with central air experience. For some homes, a central air system is not economical or possible. Older historic homes were not designed for duct systems and in order to run duct in the homes, you may need to reduce the ceiling height or damage the historic design of the house. In apartment buildings, townhouses, and mobile homes, it may not be possible to run duct work and therefore a ductless solution (to be discussed later) can be a better choice. You should choose this option if you already have a duct system in your home. Changing out the condenser, air handler, and coil can be less expensive than using a ductless system for each room. Window AC units are self-contained heating and cooling solutions that hook into an opening in your window. The window unit is commonly used for places that cannot put in duct work. They are very simple to install and just works right away. It does not take much technical skill to get this unit up and running. Window AC units are notorious for their high loud noise. The fact that these units are hooked in through the window will leave your home open to possible intruders. Additionally, a window must be sacrificed for this option to work. You should choose this option as the last resort. There are units that are cheaper and offer better cooling capabilities than the window units. Portable AC air conditioners are the most flexible cooling solution available. A portable air conditioner is mobile and only needs a small opening in the window to let out the air. The main advantage of the portable system is its portability and flexibility. You can move the portable unit easily between rooms without much effort. They are excellent for providing emergency cooling when your primary AC system is down. For small rooms or additions, the portable unit can supply cool air in places that your existing central air system does not reach. The portable AC units are also the cheapest cooling system available. Portable AC systems are very loud. Their high noise makes it difficult to sleep and therefore they are not appropriate for the bedroom. Portable units are excellent for emergency or temporarily cooling. For small spaces that you don't occupy often, a portable unit is a great choice to keep those locations cool. The ductless mini split is a heating and cooling technology that was developed in Japan in the 1980s. Around the world, ductless mini splits make up the majority home HVAC systems. 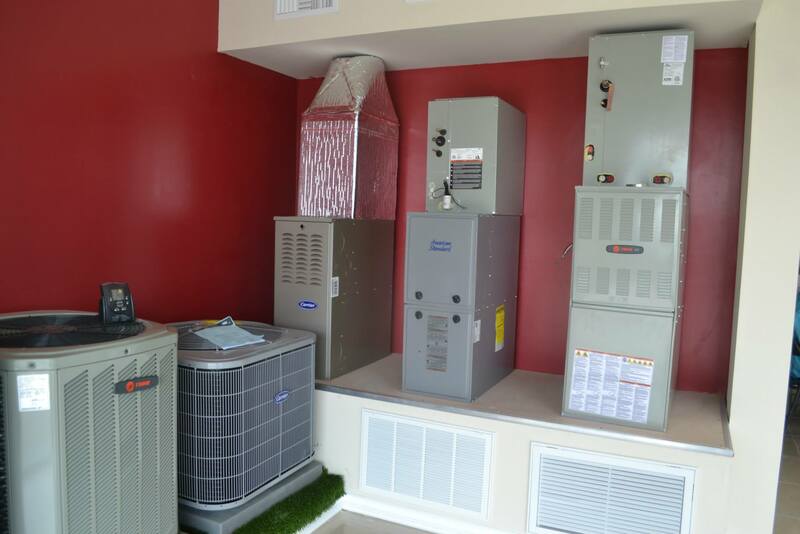 These units consist of two components: (1) an indoor air handler and (2) an outdoor condenser. To use a mini split, you simply set a temperature with remote control and turn it on just like a television. Due to their DC inverter technology, duct mini splits are the most energy efficient system available. These systems can go up to 27 SEERS and the average system is above 18 SEER. Contrast this with a central air system that hovers around 14 SEER. Due to the energy efficient design and the lack of energy loss in the duct system, ductless mini splits can save you up to 50% on your energy bill. The technology behind the ductless mini split is very reliable and has been perfected over many years and many different climate conditions. Additionally, these systems include air filters, allergen filters, and humidity control. Ductless mini splits are a relatively new technology in the United States. As a result, fewer contractors have the specialized skills to install these units. The cost of a ductless mini split can vary depending upon the local market conditions. For some markets, these systems are less expensive than a central air system and for other markets, these systems are much more expensive than a central air system. Ductless mini splits are great for homes that do not have or cannot have a duct system. These units offer individual heating and cooling control. They are the quietest heating and cooling system available on the market and makes getting a good night sleep easy. If you have people in your house that have different temperature preferences then the ductless mini split is perfect. It will allow each person to control the temperature of their own room. These systems are ideal for home add-ons and renovation spaces that are not connected with your duct system. There are many different air conditioning systems that are available on the market. The "right" one for your home will depend upon: (1) your budget, (2) your existing home configuration, and (3) your own preferences. In general, if your home already has an existing network of ducts, then the central air split system may be the most economical choice. If you don't have a duct system or cannot install ducts in your home, then we would recommend the ductless mini split. For smaller rooms that only need temporary cooling or needs to have flexibility, the portable AC units is the best option. In most cases we would not recommend a window AC unit due to their loud noise and security issues of opening a hole for outside intruders.